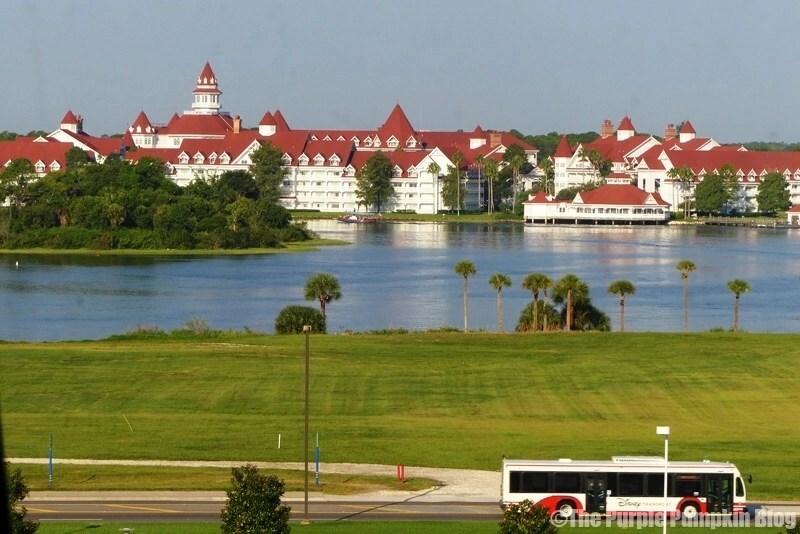 Our day started with a drive to Disney’s Contemporary Resort. Since we would be coming back here in the evening, we wanted to valet park for the day. Yes, we could have done it for free by just parking and walking to the hotel, but since I was having trouble walking, I wanted to make everything as easy and pain free as possible. 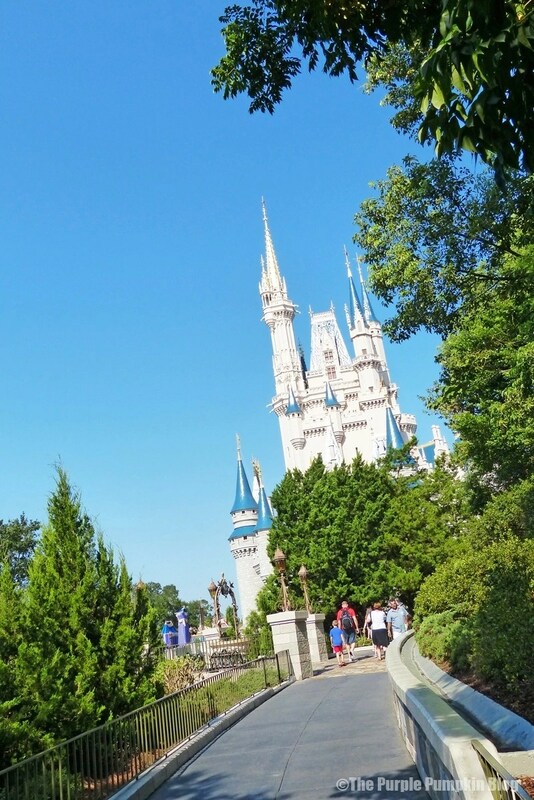 We were having breakfast at Cinderella Royal Table, and so, took the monorail to Magic Kingdom. I love the monorail journey as the scenery is awesome to look at! By now I was hobbling along, so Steve went ahead to the Castle to let them know we were on our way – we didn’t want to miss the reservation, and be charged for it! They couldn’t seat us as we weren’t a full party, but eventually I hobbled in. 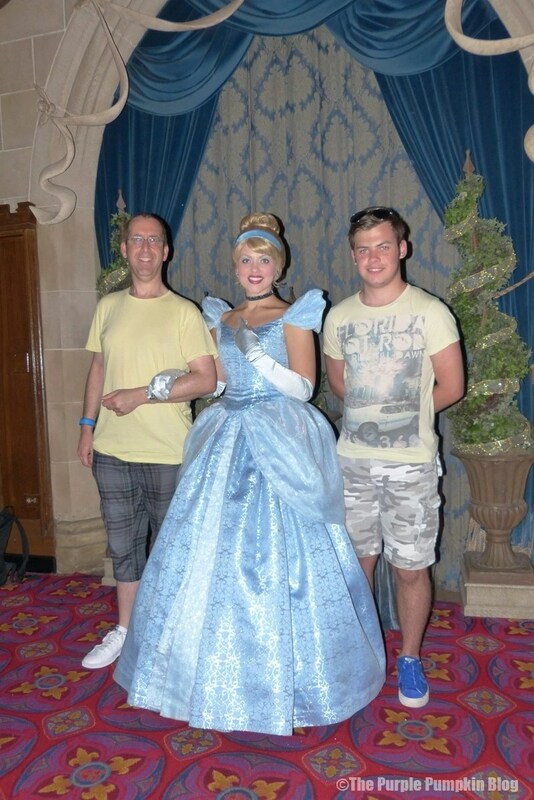 The boys had a photo with Cinderella, before we were called for our reservation. 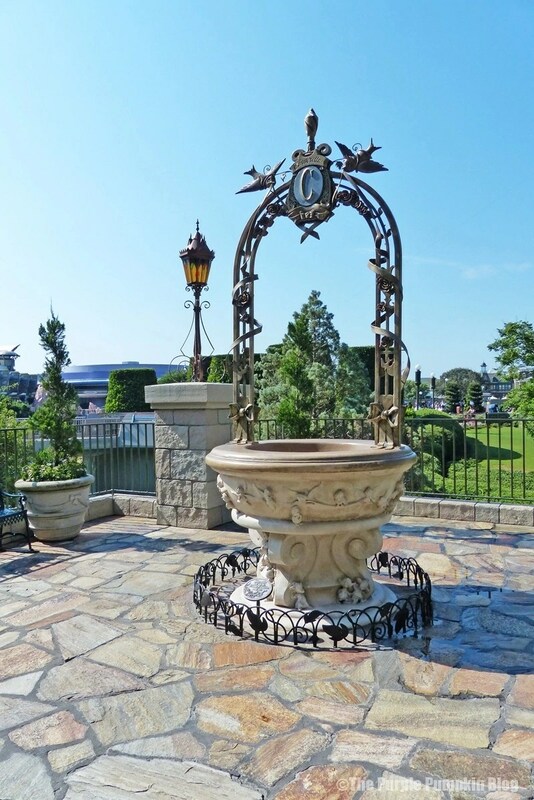 I booked Cinderella’s Royal Table because I wanted to see what the fuss was all about! We were shown to our table and given a menu. The restaurant was fairly busy, and it was lovely being inside the castle. 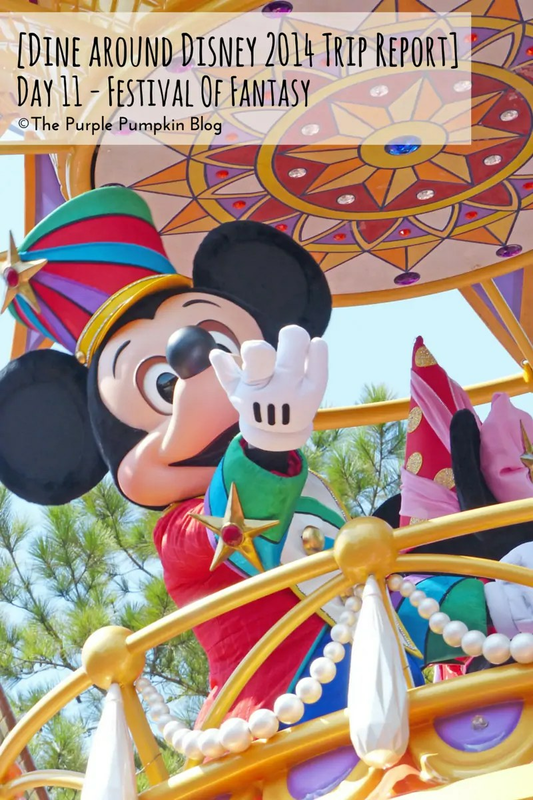 When it comes to the Deluxe Disney Dining Plan and breakfast at a table service restaurant you are entitled to one appetizer, one entrée and one non-alcoholic beverage per person (usually refillable) Signature restaurants are 2 credits per person. 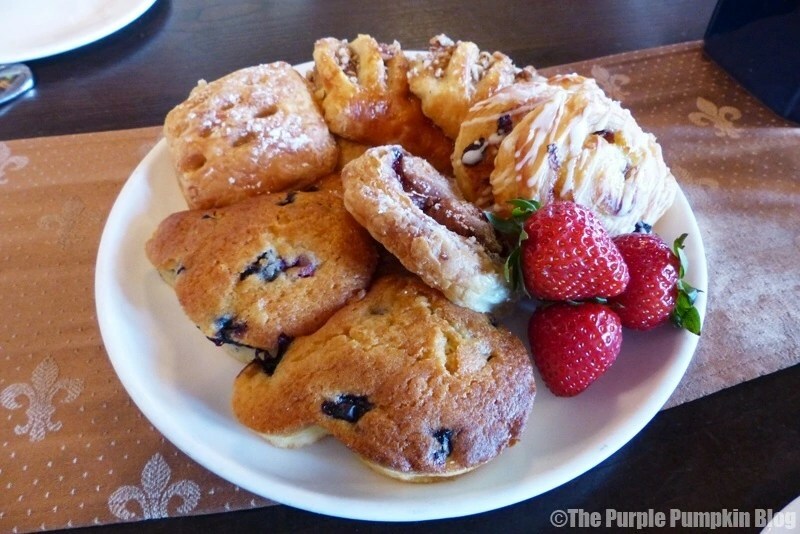 There is just one appetizer at CRT, which is a Pastry Plate with a selection of pastries – including Mickey Mouse shaped muffins. 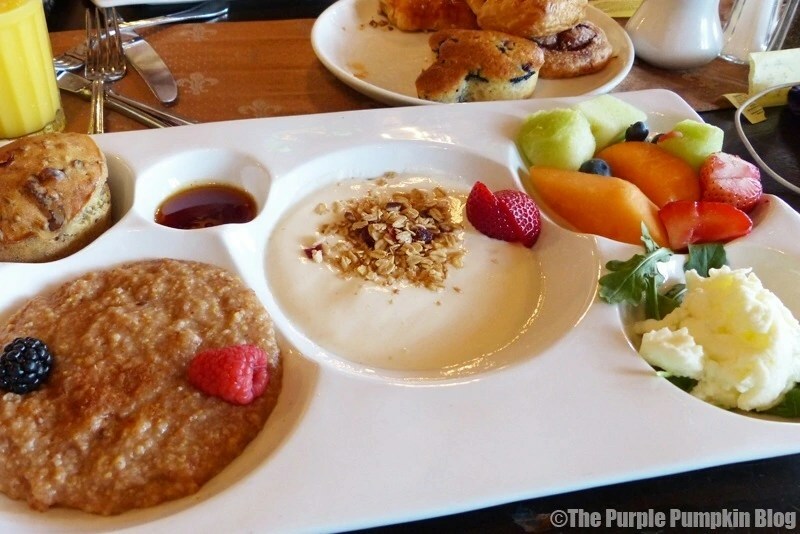 I’ve mentioned before how we were pretty much done with breakfasts on the dining plan! Looking at the menu, it was very decadent, and fit for a princess or prince! But not for us at that time of the morning. Me: Healthy Choice – Scrambled egg whites, hot ten-grain cereal, Greek yogurt topped with castle-made granola, no sugar added walnut-sunflower bread, and fresh fruit. 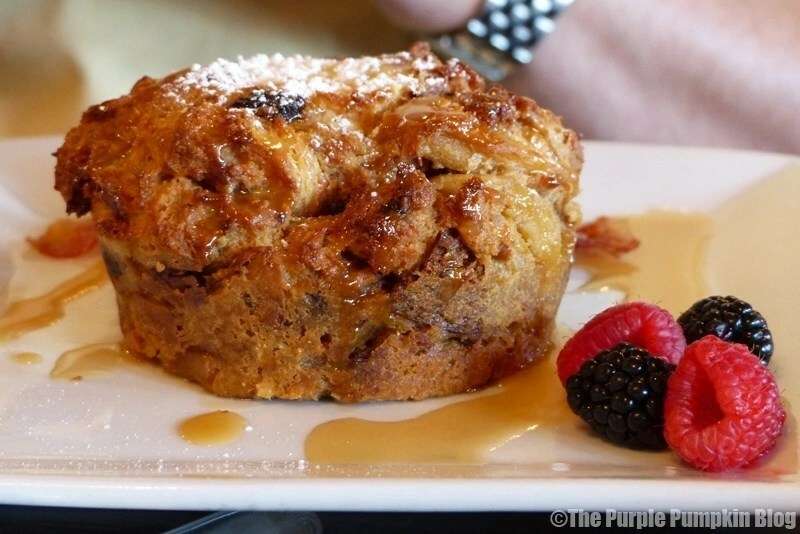 Him: Caramel Apple Stuffed French Toast – Decadent French toast stuffed with sweet cream cheese, baked with caramel apples, and drizzled with a Calvados caramel sauce. The Boy: Traditional Breakfast – scrambled eggs, sausage, bacon and potatoes. A holiday so far of food indulgence meant I went for something lighter with the healthy choice breakfast. All the elements came served on a big plate with recesses for all the components. I wasn’t fan of the hot cereal, but I enjoyed everything else. Steve had the French toast, which was rich and very yummy. Liam is better suited to a buffet style breakfast, as he can pick and choose what he likes. 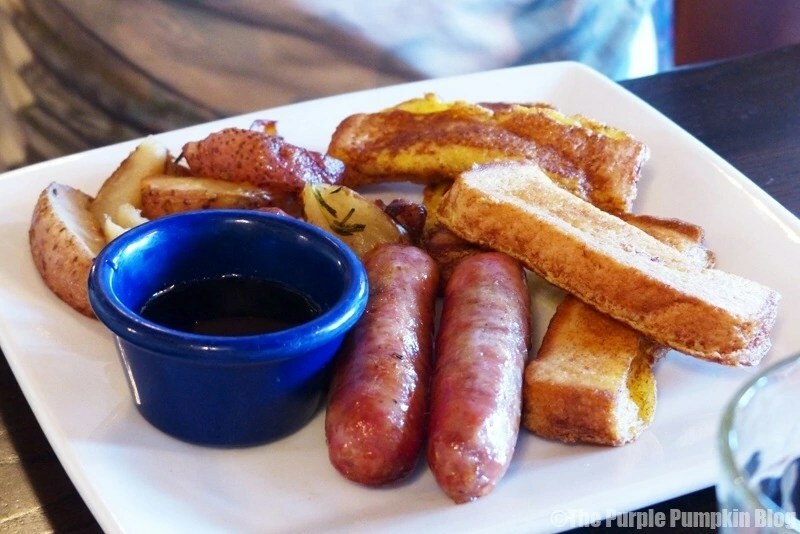 He doesn’t like eggs, and didn’t want bacon either, so the waitress switched them out for some French toast sticks instead. He ate it all, so I know it was good! During breakfast, the Princesses walked from table to table for autographs and photo ops. Our Princesses were Snow White, Aurora, Ariel and Jasmine. 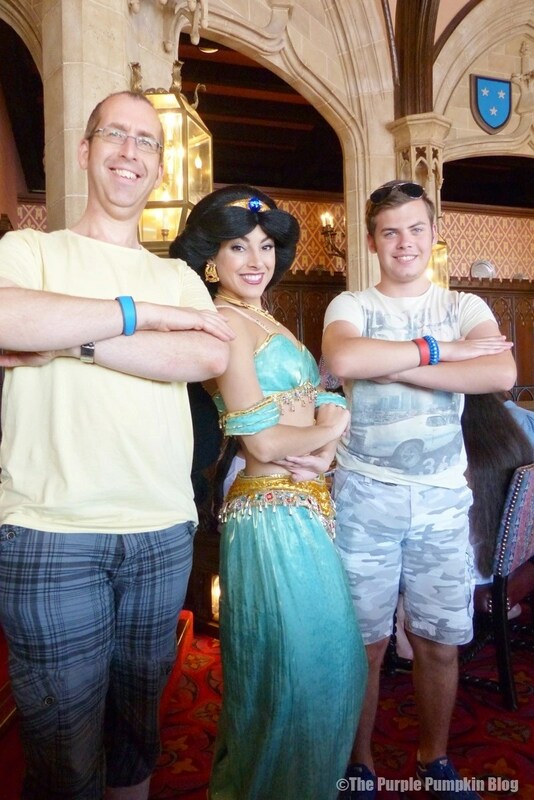 We’ve not met Princess Jasmine before, so that was pretty cool – she was also the most awesome of the Princesses we met! 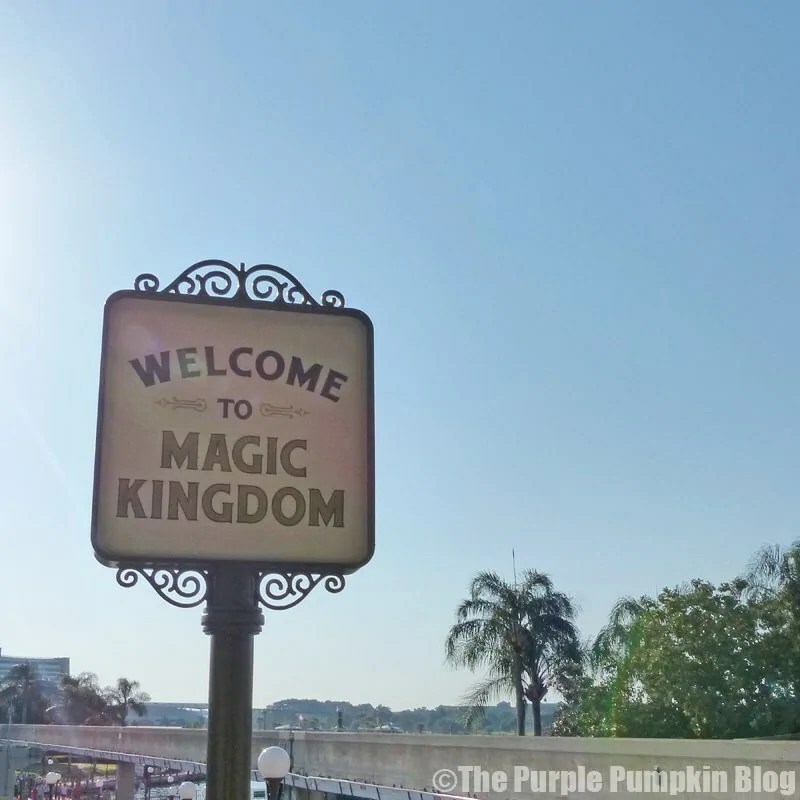 Once we’d finished breakfast, we paid our bill (tip is included) and went on our merry way for a day at Magic Kingdom. 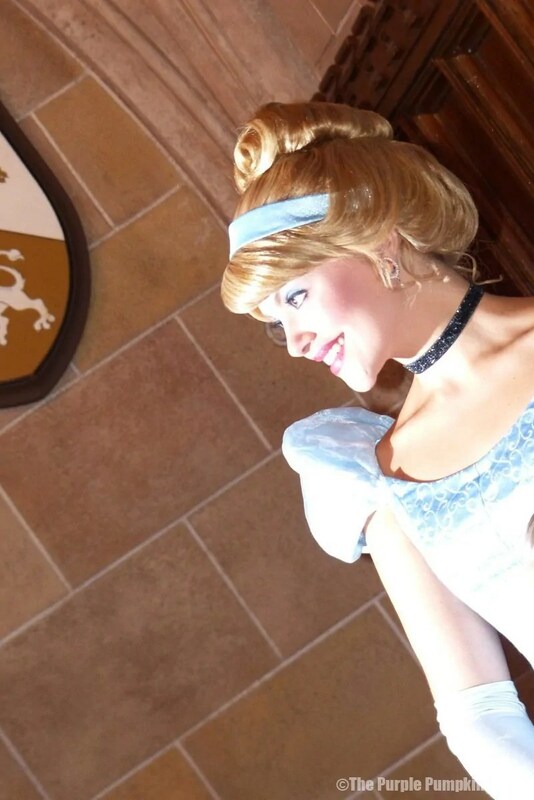 I’m glad we got to experience Cinderella’s Royal Table, but would unlikely do it again. Not because it was expensive – dining in Disney is expensive (although, we were on the dining plan) but because, now that it’s done, there isn’t a need to do it again. We weren’t blown away by the food, and since I don’t have young children, meeting the Princesses isn’t the be all and end all for us as a family! 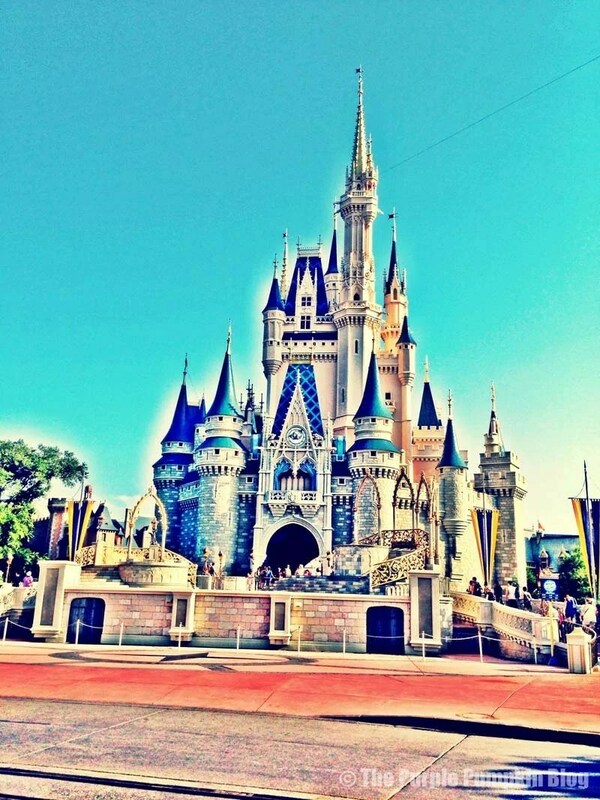 But dining in Cinderella Castle is magical and I’m glad we’ve done that! There was barely a line for her, so we didn’t have to wait too long. 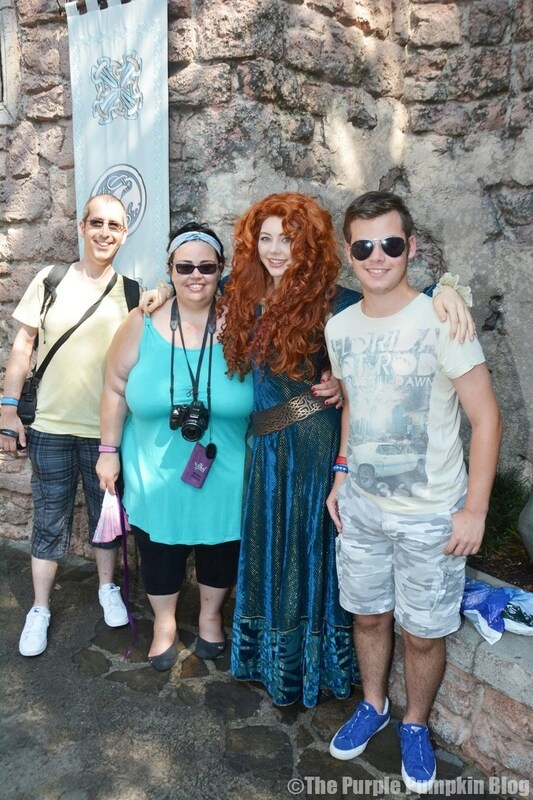 I really loved the castle grounds area for Merida, and it was quite shady too! Always a winner in that Orlando sunshine! Wow everything about that looks so magical. We just went to Paris this week and my youngest was disappointed that we hadn’t taken him to see the white castle. I need to start saving to take him over. Thank you for all your posts they are really helpful.